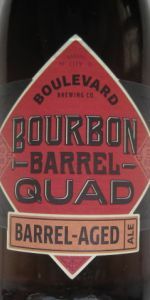 Bourbon Barrel Quad Barrel-Aged Ale (BBQ) | Boulevard Brewing Co.
Based loosely on the Smokestack Series’ The Sixth Glass, this abbey-style quadrupel is separated into a number of oak bourbon barrels where it ages for varying lengths of time, some for up to three years. Cherries are added to make up for the “angel's share” of beer lost during barrel aging. Selected barrels are then blended for optimum flavor. The resulting beer retains only very subtle cherry characteristics, with toffee and vanilla notes coming to the fore. Nice copper brown collar with tightly packed white head with good retention considering abv. Aroma is so so strong of vanilla and bourbon. The bourbon notes are overpowering for both the smell and taste, which is mostly bourbon vanilla and abv. Coconut in there as well. Ok, but tastes sort of artificial because of intense vanilla and bourbon. Poured cloudy with very foamy head. Can really taste the bourbon from the barrel aging! This bottle has a best by date in July of this year. The hazy dark cherry wood colored beer pours out into a snifter glass with a 1” tan head that briefly leaves some patches of lacing on the sides of the glass as it soon recedes to a thin irregular island of foam that then disappears entirely, as do the initial patches of lacing. At first sipping creates scattered patches of lacing on the sides of the glass but well before midway through the beer there’s no lacing or foam left at all. The aromas are rich, smooth and well integrated. They include some bourbon, some malt and some dark cherries. There’s also a good bit of vanilla and, in the background, there are some other dark fruits along with a light touch of oak. The flavors are much as expected from the nose with the bourbon, some rich malt sweetness and some dark cherries up front along with some vanilla. In the background there are also other dark fruits (plums, prunes) and an almost hidden bit of oak. There’s no bitterness showing but there does seem to be a bit of very light grassy, earthy character. The mouthfeel is on the full side of medium bodied and smooth with virtually no carbonation. The finish begins as the bourbon and the dark cherries start to recede, to be followed by the malt sweetness and the dark fruit. There’s a light tartness from the cherries that persists through to the semi-dry, slightly earthy ending that also still shows vanilla and some very light oak. On the whole I am enjoying this beer and would be happy to have it again. The cherries make a nice contribution to the overall complex aroma/flavor profile created by the Quad and the Barrel aging. It’s a perfect beer for sipping by the fire side on a cold winter night. Bottled 8/4/16; drank 9/20/16 @ the Yarchives. Opaque dull orange/red rust appearance. A rough pour yielded a huge eggnog head; strong, frothy lace. Plum, bourbon, oak & banana notes in the nose. Bourbon, oak & plum flavors up front; banana notes on the finish. Booze heat emerged as this warmed. Some nice quad notes but the bourbon barrel dominated this. Maybe aging would help? This is an ale influenced by an old abbey ale but the bourbon notes kick this up a few notches. This one is all around delicious, perfection in a way of blending two unique styles together. This beer is a real classic for me, one of the first I tried aging, with great results; this one is three years old. It has a pretty typical look for a quad, which are not the prettiest of beers IMHO, but it’s still quite pretty. Aroma is nice too, offering a pleasant promise of rich cherry and gentle boozy bourbon. Then the wonderful taste unfolds, blossoming with candied cherry, whiskey, subtle spice and a backbone of honeyed malt, all wonderfully blended by a little aging. Mouthtaste is exactly right. It really is a classic, among the best of American quads. Poured a slightly murky root beer brown with a three finger tan head that dissipated quickly. Heavy lacing was present. Nose is mild cherry, malt and brown sugar. Taste is sweet malt, caramel, brown sugar, cherries and very mild bourbon. The alcohol is well hidden in the flavor. The feel is heavy with moderate carbonation and of course a slight warming sensation from the high ABV. Bourbon Barrel Quad Barrel-Aged Ale (BBQ) from Boulevard Brewing Co.